French Paintings of the Nineteenth Century from the Collection of Mrs. Mellon Bruce. Exh. cat. California Palace of the Legion of Honor, San Francisco, 1961: 12. Breeskin, Adelyn Dohme. 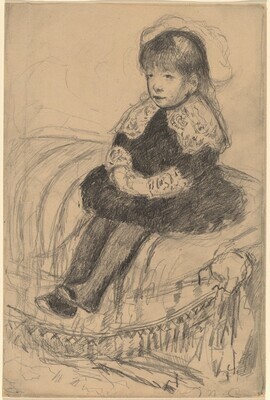 Mary Cassatt: A Catalogue Raisonné of the Oils, Pastels, Watercolors, and Drawings. Washington, DC: Smithsonian Institution Press, 1970, no. 771. Wadley, Nicholas. Impressionist and Post-Impressionist Drawing. London, 1991: no. 18. Smagula, Howard J. Creative Drawing. London: Brown & Benchmark, 1993 (reproduced only, p.2.6).